THANK YOU NOTE: First, The Varnished Culture thanks the folks at Her Majesty’s for their courtesy. TVC had bought tickets for a Saturday show, foolishly overlooking it was a matinee and missed the show. After some phone calls, full of contrition and abashment, TVC was allowed to present at the box office, and, with a little grovelling, to exchange redundant tickets for a Monday night performance. It wound-up with better seats! Again, thank you guys! It is greatly appreciated. 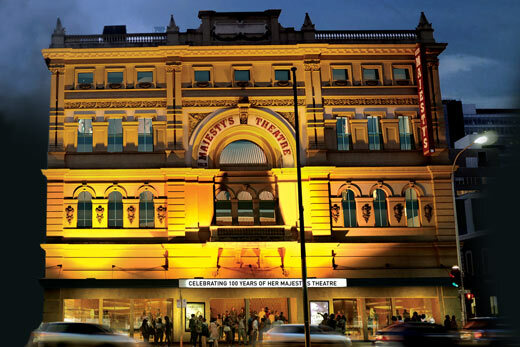 And what a magnificent theatre it is and has been – the plan to revivify this historic venue is one to support and celebrate. George Orwell’s classic novel re-appears as a theatrical piece in this production by State Theatre Company, adapted from a 2013 UK piece by playwrights Robert Icke and Duncan Macmillan, which is certainly the best State Theatre Co. production that we have seen in some years. Having said that, regretfully, this doesn’t set the bar very high. 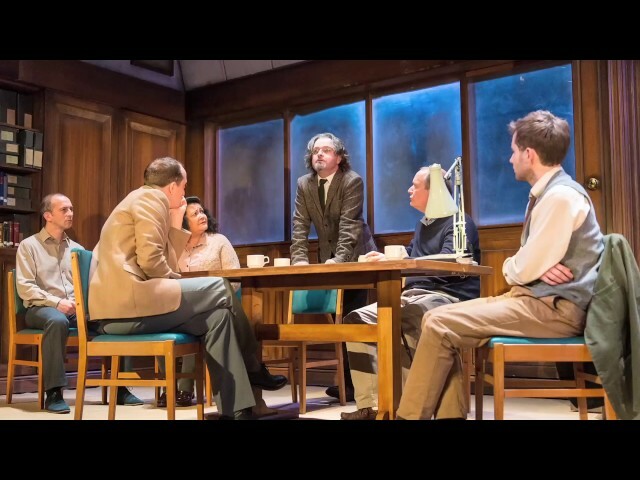 Whilst it has some clear drawbacks as a synthesis of Orwell’s classic, viewed simply as a bit of theatre, it is, at times, pretty sensational, at others, very silly indeed, and overall, does not quite deliver. The same show played at the Melbourne Festival in 2015. At that time, the fashion was to describe how spookily relevant it was, in the wake of Edward Snowden and Bradley Manning. But Ed’s living the life of Riley (or Philby) now, in Russia, and Bradley/Chelsea is scot-free. The current Adelaide version, which sets-off around Australia near the end of the month, is ‘spookily relevant’ just now because of Mr Assange and the spectral arrest warrant, and Herr Trump with his “alternative facts.” The primary fact of the matter is that Orwell’s novel is ‘spookily relevant’ all the time because of its sarcastically gloomy sermon on the human condition and its reflections on our tendency to team-up, and break-away. The collective demons become individual devils, and we swing betwixt social cohesion and individual liberty, somehow never getting the balance right, and sometimes letting the pendulum swing too far. Don’t come to Orwell’s novel with anxiety or depression. Tis a horror story of universal application. Similarly, don’t attend this play with a headache. It is loud (sometimes too loud, as though the quiet terrors of the book are too nuanced for the modern sensibility), brusque, abrupt and dingy; occasionally violent to a grisly degree. P found himself squirming in his seat when the electrodes were applied or the rat cage wheeled-out. Or when the set changes whirled about (with impressive speed). The offices depict Kafka’s castle, re-done in depressing brown timbers of dubious provenance. Ghostly faces glare through dirty, frosted windows. Lights flicker and occasionally flare, always setting an uncomfortable mood. The blood is an alien pink. It’s as if the sets and scenes were designed by Bureau Mirko Borshe. There are two-minute hates, loud tele-screen announcements, glib exchanges in Newspeak by colleagues such as Symes (Guy O’Grady), repetitive flourishes (silly Mr Parsons, played amusingly by Paul Blackwell, who gets a few reprises), and folksy references to childish things that have now been rendered sinister by the machinations of the State. (“‘When I grow rich’, say the bells of Shoreditch.”) However, there is precious little evidence of the fiendish comic sense with which the novel is suffused. The performances are fair, on a sliced-ham level. Tom Conroy, as Winston Smith, can’t erase the memory of John Hurt in the film but is okay as the doomed heretic who is ‘cured’ in the end. Ursula Mills, as Julia, has a dilemma; how to flesh out such a mannish (and marginal) act? But she is still vibrant enough in the usual, thankless, female role. Terence Crawford, as O’Brien, seemed to be from the Department of Treasury rather than the Ministry of Love. There was no sense of the fanaticism that surely inhabits the man, and some of his best, most appalling utterances could have packed more punch had they been delivered less emphatically. The most effective player for TVC was Renato Musolino, in a dual role as O’Brien’s servant and the ‘tea lady’ (or ‘gin man’), whose slow, stylized movements and expression paralleled Kabuki theatrics. In sum, the piece is full of sound and fury, and often diverting, but if you want something significant, READ THE BOOK.